Wow. The response to our 30/30 challenge has been amazing. In about 12 hours we had 11 other bloggers say they would take the challenge with us. When I am feeling tired and finding it hard to get out of the house I will know that others are facing the same struggle. When we are out walking we may physically be doing it alone but will know a bunch of our friends are with us in spirit. I am going to post progress updates every Friday and a way to keep us on track and to share the things that come up for us as we complete the challenge. Some of the bloggers who are joining us have said they are going to do the same. Stop on by their blogs to show your support. 1) Nuurdy Girl – She recently wrote a great post comparing the FitBit and Fuelband fitness monitors. 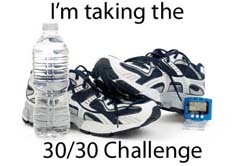 Either of them would be great tools to help keep track of progress during the 30/30 challenge. 2) Kol’s Notes – They post a “Tasty Tuesday” recipe each week that shows you how to make healthy and wholesome snacks for your pup. Check out their latest recipe, Quinoa and Pumpkin Dog Treats. 3) Tales and Tails – They are using the challenge as training to get ready for the Idita-Walk in February. The walk looks like a lot of fun and we are seriously thinking about joining them this year. 4) Terrier Torrent – They like a whole host of outdoor activities like us. They recently took us with them on an awesome kayaking trip with Manatees in Florida. 5) The World According to Garth Riley – We are glad he joined our challenge but are afraid he might find walks a little boring seeing as how he recently went paddle boarding. 6) A Novice in All Things – Charlie and his Dad are one of our newest bloggy friends that we are going to live vicariously through. They are getting ready to hike the Appalachian Trail and we are very jealous….err….excited for them. 7) Rescued Insanity – They already walk for 30 minutes or more every day. They decided to take our challenge but make it their own by trying to run 30 minutes a day instead of walk. I got the pleasure of meeting the Author at Barkworld in October. I would have never known she was an introvert if she hadn’t written about her “overwhelming” experience. 8) Puppy In Training – They are taking the challenge because this blogger is so busy training guide dog puppies that he doesn’t always get his own dogs out for a walk. 9) My Life in Blog Years – OK…so I am going to call cheaters on them a little. They live in sunny southern California where the weather is always walk inspiring (unlike where we live). Ha, ha. There is a great post on their blog about trimming dark toenails in case your need to trim your pup’s before you start walking daily (if they are too long it can be painful for your dog when they walk on a hard surface). Some of our non-blogging friends taking the challenge include our Twitter friend Jen and blog fan Cindy. We also got some support from of our other friends even though they are not taking the challenge themselves. PDog offered to help keep us on track with our walks when I am over visiting my Grandpa. Roxy the Traveling Dog wants to see pics of us walking. They will be able to find all of the ones we post to Twitter and Facebook easily if we use the hashtag #roxysdogwalkpicaday. And…..TA, DA! Due to the overwhelming response to this challenge I figured I better create a badge that those participating can post on their sidebar to let others know what they are up to. I’m not surprised that you had a lot of people join the challenge, truth be told! Bunny and I are kicking things off on the first with a hike to see the frozen waterfalls. You have to start out with a bang, right? Never mind! This badge is even nicer – we plan to walk again tomorrow for the entire month….nice to see such a great turn-out! I really should also sign up to do this with everyone else. I am sure my dogs would love it. We do go to the park a lot- normally 3-4 times per week for at least an hour. But a consistent walk every day would probably be nice for them. I already know a number of my fellow challenge participants & will enjoy getting to know the rest of you. I’ve created a ticker to chart my progress and will be updating it and adding it to my blog post each day. Thanks for getting this started! Thanks for the tip and I like your ticker idea. It will be fun to follow your progress. Awesome, we already walk everyday….well most days. The weather is a problem sometimes for sure. I will seek support from all the walkers in bad weather areas. Can’t wait to see all the pictures too. Fun!!! I just quit working here on the mountain top to take a few days a week to take care of my Mom 80 miles away. I’m going to make up for the loss of time with my work friends by walking every Tuesday with them to the State park up here. Of course, the wieners will be tearing out the door to go with me. They’ll have to take turns tho. Maybe I’ll work up to once a day! When I have four dogs at my house I sometimes take them all out together. Craziness! I often think about breaking it into shifts and taking to out at a time…but then I get lazy and don’t feel like walking that much. Ha, ha. I imagine you have no choice. Cheaters… me? Technically I don’t live in live in sunny southern California. It’s more like Central California’s Pacific coast where we get overcast skies and mist from the marine layer – but whatever 😉 Your challenge is accepted! Ha, ha. I was just teasing ya 🙂 My plan seems to have worked though. Ha, ha. We think this is such a great idea. We hope more peeps join. Win win for everyone we say. Nice one! Have a super Sunday too. What a great idea. I may just join in on this one (unofficially). I already try to walk my dogs every day, but without Yak Traks or something else to keep me from falling on my arse, I have been a little lax this past month. The week off over Christmas and New Years meant I could walk at the dog park in the morning when I can see the slippery spots (usually between 1-2 hours), but that will end soon. Guess I better get those Yak Traks! Yak Trax are awesome! I love mine. We don’t get snow and ice at our house often but I used them last year when we got about 6 inches of snow. I use them for winter hikes when snowshoes would be overkill. We’re excited! The sun is out and shining today. Maybe I’ll get *totally lucky* and it will stay like this all month. Eh?? Eh??? Probably not, huh. Oh well. We’re in all the same. I’m even buying new leashes! dang it! the HTML just disappears! I am not sure why WordPress won’t let you post the code. Someone else tried too. She emailed it to me and I added it to the post as an update. Thanks for trying. Sun is out here today, too! In WP, I used a text widget; in Blogger, I used the text/HTML gadget. Thanks for digging. It seems that WordPress won’t let someone post HTML code in the comments but I got a version of it and added it to the post. Best of luck to you and everyone else that is taking the challenge! It’s a wonderful challenge, wish we could participate but we will be here cheering you on! Being a dog in a fitness household I can tell you that starting is probably tough but you need to find a time like first thing in the morning to do the 30 min walk so you don’t have excuses like needing to go shopping, out to dinner, working late, etc and after you get to doing it daily around the same time for 2-3 weeks it will become a habit and the longer you do it the more you will miss it if you don’t do it. You and your pups will be so much happier getting out even if it is only a 1/2 hour 🙂 I know mom, my sis Katie and I look forward to our walks every day! Thanks for the tips and encouragement. I have done a lot of training for fitness in the past and, yes, have found mornings are best for me. However, sometimes my schedule just won’t allow it so I am going to have to be flexible here. I am not even letting the dark and cold stop me if that is what I have to do! Ha, ha. I told myself we HAVE to walk 30 minutes a day but that is a minimum. Our favorite park to walk in has a path that takes an hour to walk. I already have some friends lined up to meet us for walks there so we are likely to get in much more than 30 minutes most days. The 3 of us along with are Weiner, Frankie, are up for the challenge! We already walk twice a day, but they have become a little shorter during the winter. Frankie really doesn’t mind going out in the rain so it’s us 2 legged creatures that need to bundle up and go for it! Gretel doesn’t mind walking in the rain either. I dislike it but Chester dislikes it most. He is going to be my biggest challenge. Glad to have you guys join us. Thanks for the badge! I just posted it on my blog and plan to post about our participation in the challenge tomorrow. I will try to do weekly updates on Fridays but sometimes have difficulty finding time to do blog posts during the week so will see how that goes. Glad to see so many of my pals are doing this! Woof! Woof! Great Challenge. Being here in HI we go for more than 30 minutes a day. We go for 5 miles a day (uphill n downhill). Just like today (New Year’s Eve) I (Sugar) swam for 2 hours. Exhausting but FUN. Love to join but we will not be able to complete the month (January) as we will be traveling (Guess Where?) It will not be fair if we join … we plan to do a post soon on how important workout with your pooch. Is it too late to join in? I read about the challenge on Tails and Tales today, and I promise you I’ve walked for thirty minutes! I’ve taken one of my dogs out twice and the other just once for a few minutes pottering because he’s hurt his back leg (and he only has one of those!). January is one of the most difficult months to get out there and walk here in the northern hemisphere, isn’t it? February is pretty bad, too, but on the whole, compared to some places, we get off pretty lightly in England. I shall post updates each Friday too. It’ll be nice to be reminded by other bloggers that an update is due!! Oh, no…it’s not to late. The challenge starts today. I am waiting for my warm walking clothes to dry to go for out walk today. Glad to have you join us. Aaah, here it is! I was looking for my reply on the wrong post! LOL! Great. Can’t wait to read your update. Be sure to share a link to your post on our Facebook or Twitter page so I can find it. So many people are participating now I think I will loose track. What a fabulous idea!!!! I’d join the challenge except that we naturally walk every day. I have a terribly bad back, and the only thing that keeps me out of pain is movement, like walking or biking. So, I have motivation that no one else has. But, I’ll be cheering for everyone else!!!! We heard about the Challenge from Garth, and we see our pal Gizmo is doing it too. We are going to join. We started today which is the 3rd Jan down here in New Zealand. And it might also get us back in to blogging too. Paws crossed.